Oh no! It sounds like the singer is struggling through her second pregnancy. She opened up about some of the less pleasant side-effects to her 9-month journey. 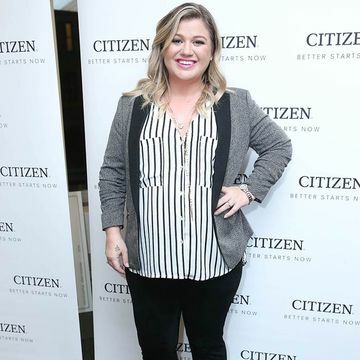 American Idol OG champ and cover queen extraordinaire Kelly Clarkson appeared on CBS This Morning recently to talk about her critics, her American Idol beginnings, her absent father and, of course, her second pregnancy—which, if the revelations she made during the interview are any indication, is a tough one. The singer, who announced her pregnancy onstage after an emotional performance, opened up to Gayle King about her symptoms. "I'm familiar with all-day sickness," she said. "I have to get IVs and fluids because I get so dehydrated. It's bad." Kelly announced her pregnancy back in August, which means she should be past her first trimester by now—the period when most women suffer from morning sickness. Kelly has already been through one tough pregnancy—she opened up to Ellen Degeneres back in 2013 while she was carrying her daughter, saying "I vomit a good dozen times a day. It's bad. I vomited before coming out here." On the flip side, Kelly has an incredibly supportive husband in Brandon Blackstock. She opened up about him as well during her appearance on the morning talk show, saying "he wins for being around," a statement meant to contrast her husband with her father, who walked out on Kelly and her family when she was young. We hope Kelly feels better soon! Some women simply tend to have tougher pregnancies and it looks like she might be one of them. With that being said, it'll all be worth when she gives birth to her son in a few months.